Fantasy revenue for companies like ESPN has more than tripled since 2004, turning make-believe sports into a very real billion-dollar business. It's lunchtime in America. Specifically, it's lunchtime on the first Tuesday following the NFL's opening week, meaning that some untold number of our fellow cubicle drones are fiddling with their fantasy rosters right now. And, in the process, they're pumping money into what's quickly become a billion-dollar industry. The Fantasy Sports Trade Association (yes, it exists) estimates that more than 33 million Americans take part the pastime, spending an average of $111 per year on league-related costs. That amounts to about $3.6 billion in spending. Now, should we believe those stats? They're based on polling data and research from Ipsos. But they come from a trade association, and it's in their interest to make their business look, well, big and important. 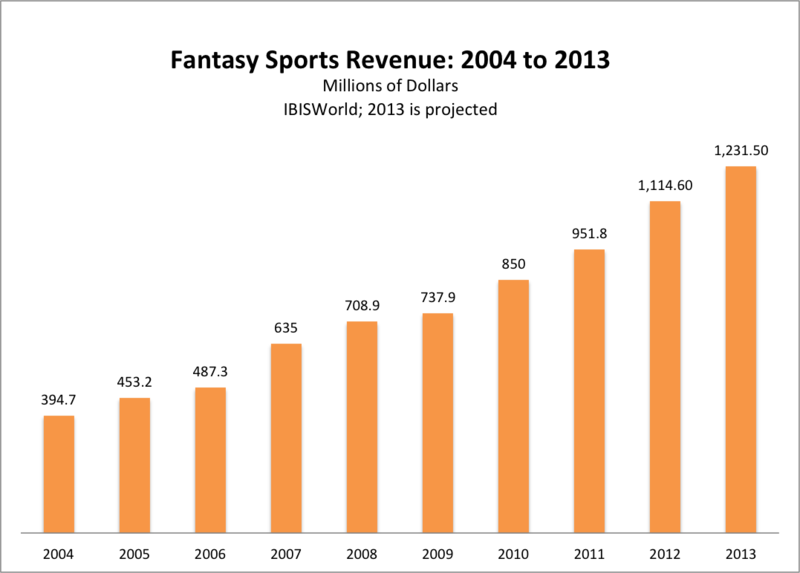 So for a second source, I turned to the analysts at IBISWorld, who estimate that Fantasy platforms created by the likes of ESPN, Yahoo!, and CBS are generating some $1.2 billion this year, powered in part by growing ad and sponsorship revenue, as well as player fees. That mound of cash has roughly tripled since 2004. Over the last five years, it's averaged 11.7 percent growth. As IBISWorld notes, it's probably not a coincidence that fantasy revenues have grown pretty much in lockstep with broadband access and the smartphone boom. It also reflects the continued ascendance of the NFL, which is the top draw for fantasy players. But, let's be honest, it also speaks to the power of legalized gambling. Yes, unlike poker, fantasy sports are technically considered a game of skill by the feds and most states, which is why the FBI isn't going and busting down any doors in Bristol. And yes, lots of leagues are all about the bragging rights. But getting people to bet their money on their knowledge of their favorite pass time is a pretty well-worn business model, one which works particularly well on the Web.